Brunotti kite boards are without a shadow of doubt, the most technologically advanced kiteboards in the world and the Brunotti BNT Special is no exception to this rule, Brunotti have been making kiteboards since 2002 and here at S2AS we’ve always been a huge fan. 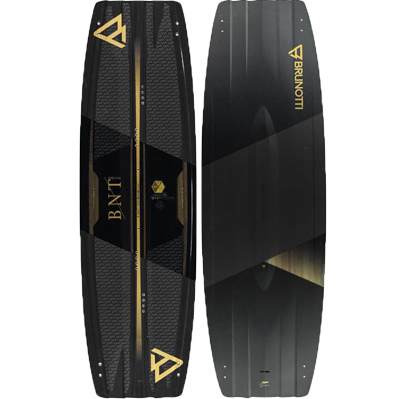 The BNT Special has quad channels, a triple concave and on the hull of the kiteboard has a small elavation making landings super smooth due to it ability to displace water more efficiently, no more blowing your knees out. Smart Torque: Newly developed 3D positioning, resulting in greater performance, control and comfort. 3C: Triple concave shape is the perfect combination between good grip, performance and ultimate comfort. DSR Tech: The DSR-tech is a great freeride rail, with a very small contact surface. The sharp rail provides loads of grip and great upwind performance. Stiffened rail edge has sufficient stiffness to provide strong pop. CNC’D W-Core: High tech W-Cores are precisly engineered to match the characteristics wanted by riders.